What is Atarax (Hydroxyzine Hydrochloride) used for? 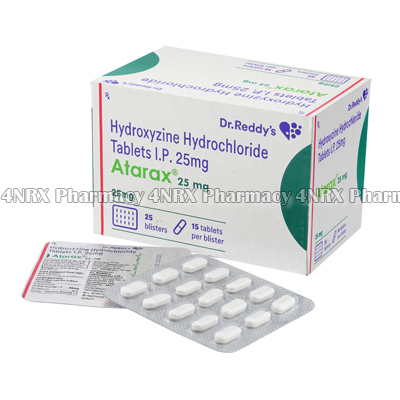 Atarax (Hydroxyzine HCL) is prescribed to treat adults suffering from nervousness or irritability caused by anxiety disorders. It also operates as an antihistamine to reduce sneezing, runny nose, or eye irritation associated with seasonal allergies. Your physician may also prescribe it to treat other conditions that are not listed here. How should I use Atarax (Hydroxyzine Hydrochloride)? Always follow your physician's instructions for using Atarax (Hydroxyzine HCL) to get the safest and most effective results from treatment. It is normally taken once each day, but your particular dosage and frequency of administration will depend on your symptoms and the condition being treated. Never change the form of the tablets prior to use by crushing, splitting, or chewing them as this may destroy or alter the form of their contents. If you have any questions about using the medicine, ask your pharmacist or doctor to ensure the correct application. What are the side effects of Atarax (Hydroxyzine Hydrochloride)? Immediately tell your physician if any of these symptoms become intense or if any other serious side effects occur including confusion, muscle spasms, tremors, or seizures. These conditions may require medical attention or adjustments to your dosage or frequency of administration to prevent more complications from appearing. Strictly follow all instructions provided to you by your physician or pharmacist while using Atarax (Hydroxyzine HCL). Optimum and safe dosage can differ based on the patient and the condition being treated.